I will say it straight away: spa and kids are not a good match! 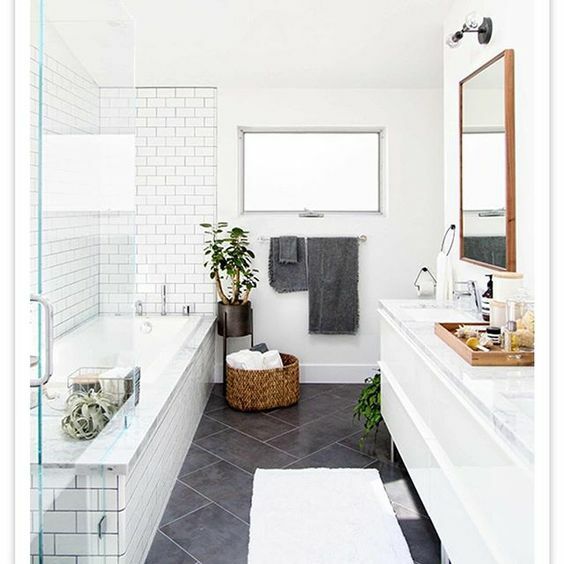 However, if you are lucky to have of a second bathroom for just yourself and your partner, then yes, go ahead, create a spa-like bathroom where you can relax after a long day! The first thing to do is to get rid of the clutter. Old make-up, half-empty forgotten "special treatments" bottles should be thrown away. Candles bring an immediate soothing feeling to the space. You can get creative and display them in decorative jars, a tray or just as a group. Adding a plant or flowers is always a good idea, or even better: hang a bunch of eucalyptuses in the shower. The steam will release the beautiful smell of the leaves and provide your own aroma therapy experience at home! Display fresh and fluffy towels, in coordinating colours. ​Rolled towels will look good on open shelving. Collect bath products in jars, it will look neat, luxurious and is easy to reach. These are actually just 5 easy and affordable actions to make your bathroom a nice retreat and relaxing space to spend the end of your day. Enjoy!